I'm not usually a fan of throwing the new couple's monogram everywhere from the dance floor to the table cloth to the napkins, but I love the way it's done here. 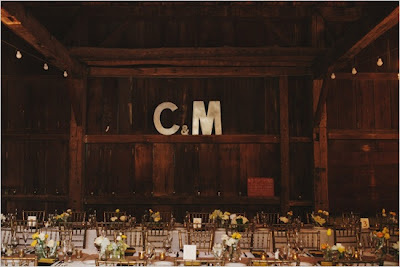 The industrial letters fit for a modern loft wedding or a rustic farmhouse; not great for a more traditional country club or hotel wedding. The letters are placed in a way that pays homage to your names, while feeling like home decor. It's natural versus the awkward white monogram tablecloth that seems to find it's way to sweetheart tables across the nation.